Winter Storm Lexi will deliver a quick-hitting stripe of snow from the coastal mid-Atlantic into southern and eastern New England through part of Friday. This poorly timed winter storm will likely cause travel issues for the Friday morning commute across much of the region. 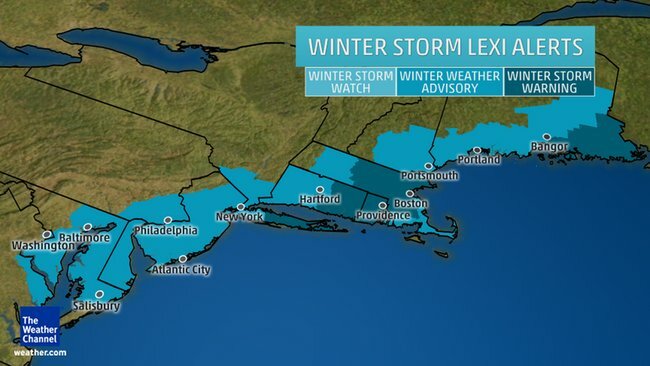 Lexi was named on Thursday afternoon after winter storm warnings were issued by the National Weather Service for more than five million people in southeastern New England, exceeding The Weather Channel's population requirement for named winter storms. The warnings were expanded Thursday night to include an even larger population from Long Island into parts of New England. The cold front that brought rain to the South and Northeast Wednesday has stalled near the East Coast. Low pressure is developing along the Eastern Seaboard and will move northeast along that frontal boundary as colder temperatures filter in, setting the stage for this swath of locally heavy snow along the mid-Atlantic coast into southern and eastern New England. 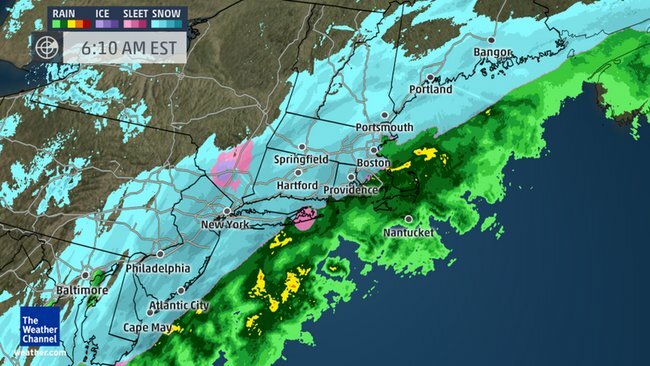 Winter storm warnings have been posted for parts of southeast New England and Long Island, including Boston, Providence and Worcester, where the heaviest snow is expected. Winter weather advisories are in effect across a swath from Delmarva region to Downeast Maine, including Washington, D.C., Baltimore, Philadelphia, New York City, Hartford, Connecticut and Portland, Maine. The Visible Infrared Imaging Radiometer Suite (VIIRS) on the Suomi NPP satellite acquired this image of the storm system at 2:15 a.m. EST on Jan. 23. It was composed through the use of the VIIRS “day-night band,” which detects faint light signals such as city lights, moonlight, airglow, and auroras. In the image, the clouds are lit from above by the nearly full Moon and from below by the lights of the heavily populated East Coast. The city lights are blurred in places by cloud cover. Rain changes to snow before sunrise Friday morning from parts of New Jersey and Long Island to southeast New England. Snow will also spread up the coast to Downeast Maine early Friday morning. By the morning rush, we expect precipitation to be all snow in New York City, Boston, Providence, eastern Connecticut and Long Island, and possibly the Jersey shore. Precipitation will change to snow over the rest of southeast coastal New England later in the morning Friday, creating slippery travel across portions of the I-95 corridor from D.C. to Maine. Snow should end in Long Island by midday, and should pull away from the rest of coastal New England by late Friday afternoon or evening. 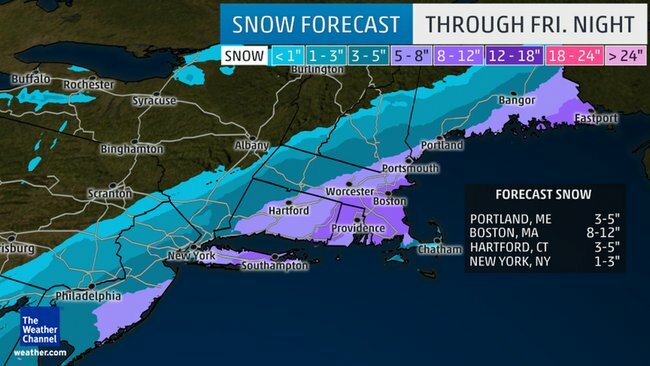 The heaviest accumulations, locally 6 inches or more, are expected in southeast New England, including parts of eastern Connecticut, Rhode Island and eastern Massachusetts, including much of the I-395 and I-495 corridors. Central and eastern Long Island may also see near or just over 6 inches, while areas to the north and west of Hartford, Connecticut and New York City will likely see only light accumulations. Snowfall rates of 1 inch per hour are possible in the heaviest snow zones. This snow will be a wet snow, meaning where heavy snow does develop, at least some scattered power outages are possible. Snow, winter weather 2015-2016 season across the U.S.